Scotch Broth is a traditional Scottish recipe that is based around a few essential ingredients. Mutton or lamb is central and cheaper cuts are used such a neck or shin. Pearl Barley is used to thicken the broth. 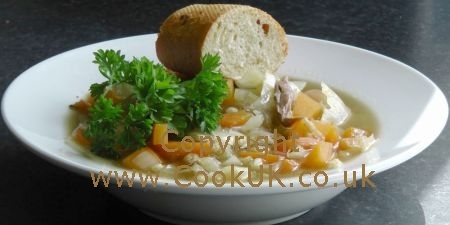 Root vegetables are the main ingredients in Scotch Broth, commonly being carrots and either turnip or swede. However, different vegetables are often added depending on what is in season. 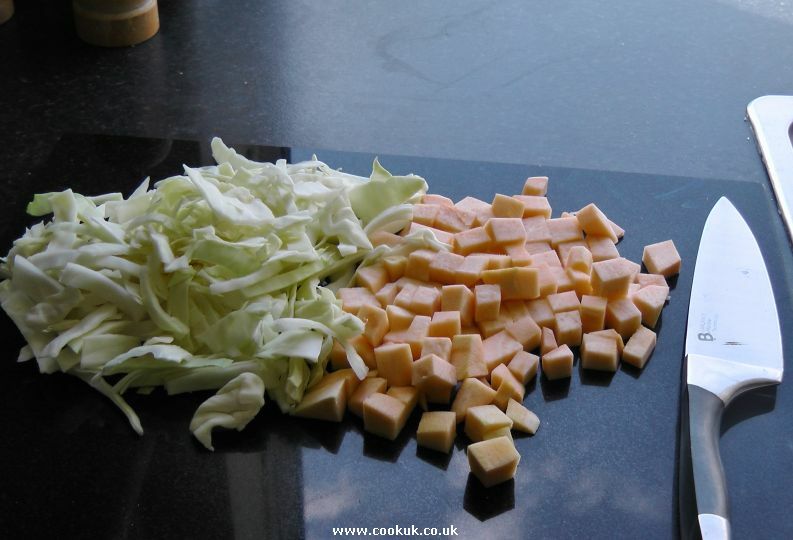 Onions and celery are typical additional ingredients as are turnips and a variety of herbs. The cut of meat also varies depending on what is to hand. Beef is often used and less commonly chicken. Not surprisingly, Scotch Broth tastes better when left in the fridge overnight and re-heated the next day, the flavours are more intense. Cooling in the fridge also has the benefit that the fat in the broth will rise to the surface and form a crust which can easily be removed. 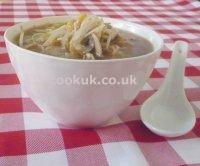 This broth makes an excellent main course meal when served with either crusty bread or potatoes. Note that the preparation time above is the initial preparation. Some of the vegetable preparation can also be be done while the broth is cooking. We have written a short article all about neck of lamb, if you want to learn more about this excellent cut of meat then click here. Ask your butcher to cut the neck of lamb into three or four pieces so that it easily fits into a large pan. Pearl Barley comes in a few forms, some require soaking overnight others requiring around an hours cooking time. Our Pearl Barley required cooking for 1 hour and ten minutes. Read the instructions on the pack carefully and add your Pearl Barley either earlier or later in the cooking process depending on how long the pack indicates it should be cooked for. Our recipe and full instructions tells you all you need to know about making Scotch Broth but if you start the video below you will see the full process. Wash the carrots and outside of the cabbage. Roughly slice the carrots, and cabbage. Peel the onion and roughly slice it. 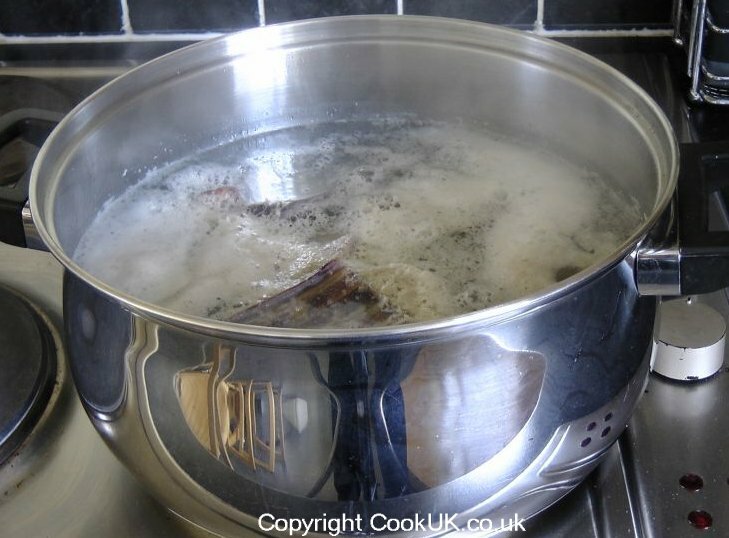 Place the neck of mutton / lamb into a large pan, fill with water and bring to the boil on a medium heat. Let it boil for a few minutes and a scummy froth will appear on the surface of the water. Take it off the heat and dispose of the water and any bits leaving just the cleaned lamb / mutton. 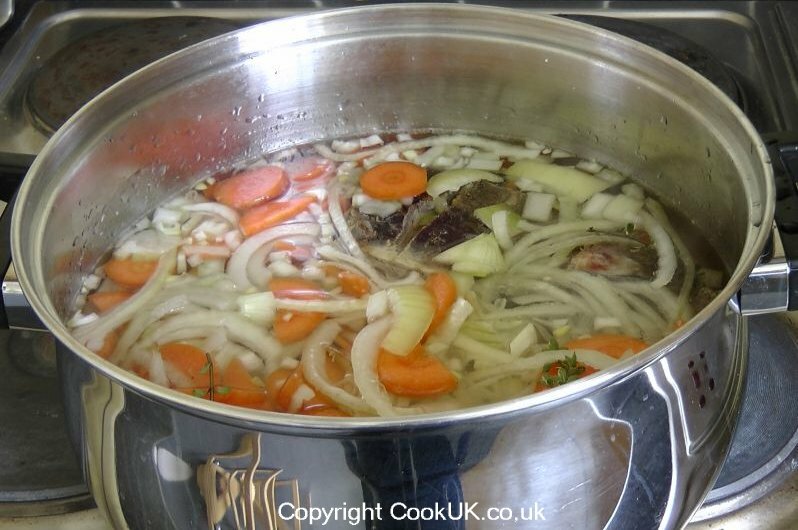 Add about 1½ litre of water (or stock) over the lamb and then add the onions, carrots, celery, bay leaves and thyme. Season with salt and pepper. More salt and pepper can be added later if required when the soup is cooked. Bring the broth to a boil and then turn down the heat to a simmer. Cook for 1 hour. We now add the Pearl Barley to the Scotch Broth, stir well and continue to cook for for a further 30 minutes. Finally add cabbage and swede to the broth. Stir these in well and cook for an additional 40 minutes. Add more hot water if the soup dries out. Take each piece of the neck of lamb from the pan and separate the meat from fatty gristle and bone. It's easy to do this with a knife and fork. Cut any larger bits of lamb into smaller chunks then add the meat back to the pan and cook for five more minutes. Have a taste of the Scotch Broth and add more salt and pepper as required. Serve into large bowls and garnish with a sprig or two of parsley. Serve with crusty bread. 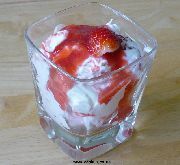 It will keep in the fridge for a couple of days and tastes even better for it! Hey Martin, turn the heat right down and simmer it gently. I made this soup tonight and it was delicious. I always buy scotch broth tins from the supermarket and thought id try making it myself, it tasted so much better! 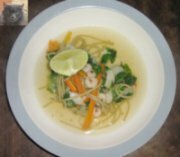 The only thing I found was that all the water was nearly gone by the time the soup was ready, I don't know if its cos there was so many ingredients in the pot but i just topped it up with boiling water and it fixed it right away :) will definitely be making this again. 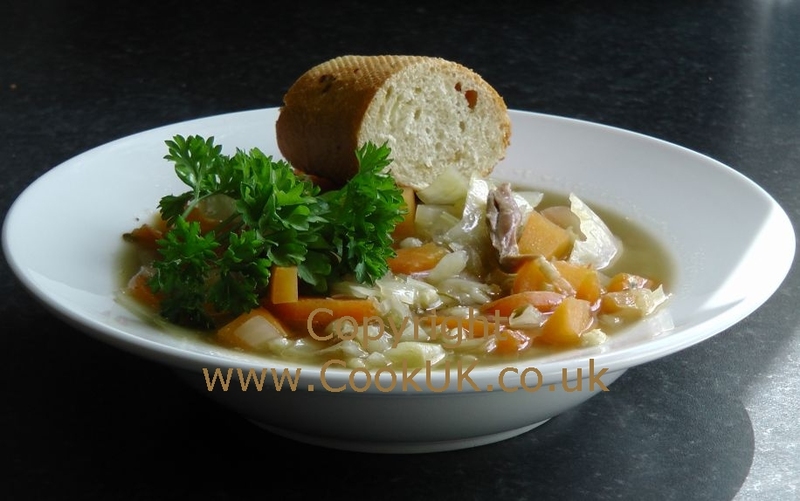 ADD YOUR COMMENTS AND RATING BELOW ABOUT THIS SCOTCH BROTH RECIPE. THEY WILL BE ADDED ABOVE WITHIN 12 HOURS. 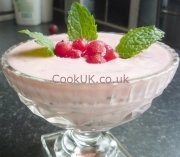 Join us on our Facebook Page for Recipe of the Day, news of recent recipe additions, competitions and lots more.